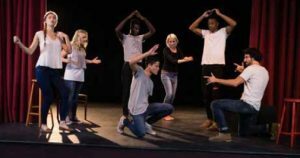 NL Collective is a project based community Drama Company for adults keen to develop their performance and theatre making skils and push their skillset a little further. Working with theatre maker Pete Lannon, the group will explore a variety of techniques, themes and issues and create and perform their own work with like-minded people. From January 2019 Pete Lannon will take up the role as NL Collective Director. Pete is a performer and director based in Glasgow, and one third of new performance company SUPERFAN. He creates playful, often highly physical devised performances for adult and young audiences, and often with performers of all ranges and abilities. He is a current Imaginate Accelerator Artist and an associate artist at Platform in Easterhouse. He was previously a BBC Performing Arts Fund theatre fellow with Imaginate and Catherine Wheels. NL Collective is payable in advance. Payment can be made by calling 01236 632828 between 12pm and 4pm Monday to Friday. You can pay with most credit or debit cards.